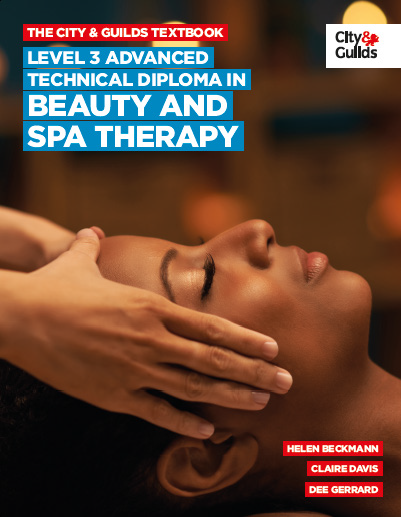 This textbook is the perfect accompaniment to the Level 3 Advanced Technical Diploma in Beauty and Spa Therapy. Published by City & Guilds, the largest awarding organisation in the UK, it maps directly to the latest standards. This book will help students master all necessary practical skills and essential knowledge. Not only is this textbook an invaluable aid to training, it will act as a handy reference guide for learners in their post-qualification careers. Tutors will find it a vital tool for planning lessons and delivering the qualification. eye-catching design to engage and inspire. Helen Beckmann has been an external Verifier for City & Guilds for over 10 years, and is also a published author. She owns her own beauty and holistic therapies salon, and is passionate about adding new therapies to her skills each year. Claire Davis has worked in the beauty industry for twenty three years, after studying fashion, interior design, and beauty therapy to level four standard. She ran her own beauty salons for ten years and set up a training academy fifteen years ago, before expanding into the world of digital virtual leaning and developing Virtual Beauty training resources. Dee Gerrard is a lecturer at The Manchester College. Before that she spent ten years as a Beauty Therapist while also lecturing in Beauty Therapy at the University of Derby and Stockport College.